Ever since I spotted cookie sticks on Amanda's fabulous site, Amanda's Cookin', I have wanted to make them! I finally got around to it a couple of weeks ago (I am so backed up with my posts), and since it was already October, I decided to Halloween~ify them:) Witch legs came to mind instantly, as the stick shape lends itself to them. Very easy~peasy and oh, SO GOOD! In a large bowl, combine the oil, sugars, egg and vanilla. Combine the flour, baking soda and salt; gradually add to sugar mixture and mix well. Incorporate the chocolate chips into the dough. Divide dough in half. On a greased baking sheet, shape each portion into a 15-in. x 3-in. rectangle about 3 in. apart.Bake at 375° for 6-7 minutes. (Bake for 8-9 minutes for crispier cookies.) Cool for 5 minutes. Use a pizza cutter to cut each section into 4 large pieces to make them easy to transfer to cooling racks. Use a serrated knife to cut the cooled sections into 1-in. strips. Use the royal icing to decorate the cookie sticks...I free-handed the witch legs by first outlining the black sectioned stockings, leaving room at the bottom for the boots. Wait about 15 minutes to dry and then fill in the black sections of the stockings. Wait about 15 more minutes and add the other colors to the stockings. Freehand the boots all at once (no outline/fill) and let them dry. When dry, add the laces. Voila, witchy cookie sticks! Thanks, Amanda! These cookie sticks are a fun, delicious and different way to enjoy chocolate chip cookies! This is so cute AND brilliant. I so love this idea I may ditch me original plan and make them for a Halloween party tomorrow. LOVE them. This is the first time I've seen cookie sticks and definitely the first time I've seen them decorated. Love the witches legs and boots! What a fun idea, I love the idea of Cookie sticks I can see myself munching from one side to the other and the witch's legs are the perfect decoration. I always choose chocolate chip over decorated sugar cookie any time and with these I wouldn't have to - Brilliant. Sue, those are TOOOO cute!!! I am so impressed by how creative you are! Oh, I love these! Very cute! What gorgeous witch legs! I love them! Ohhh Sue these are adorable, I love the witches' legs! Thanks os much for the shout out, glad you liked the recipe, so fun! These are adorable. I have never heard of cookie sticks. Love this idea and the colors are so bright and fun. These are so cute Suzanne!!!! Sue, these are so darn cute! I love your icing. My kids would think that was so cool if they found one (or a pair) of those in their lunches today! Great job! Oh my this is absolutely brilliant! At first I thought they were the stockings & boots of those little leprechauns he!he!Your halloweenification of these cookie sticks rocks! How cute are those?!! You could sure serve me a pair of those legs. 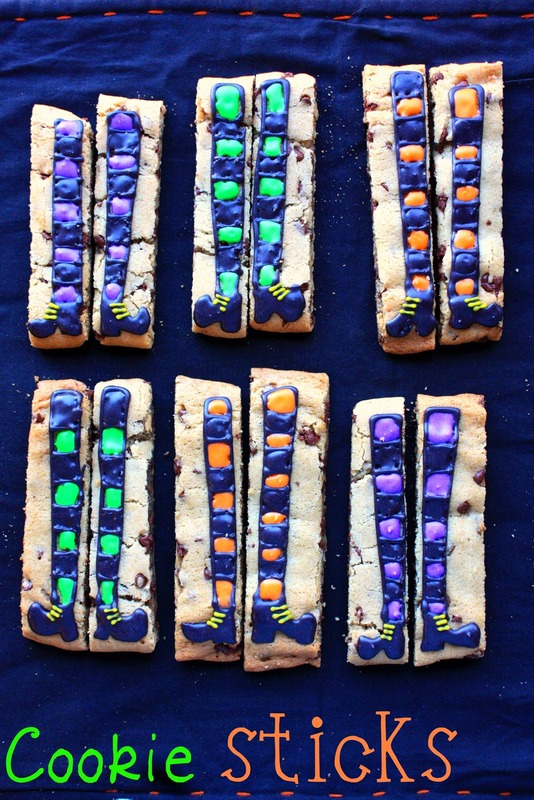 I love how the long legs fit so great on the long cookies. I shouldn't be craving sweets as I have had plenty, but somehow it never works that way. Of course I had to pin them! I make cookie sticks but mine never looked this good. WOW. Sue...you are having a FUN October...well, I guess it's November and I'm late, ha! Anyway...all of your goodies are precious! These are SO MUCH FUN!!!!!! I am confused why i'm not getting your blog updates, I used to get a notice when you updated. I just re-became a follower, I hope that solves the problem!! I LOVE how these came out. just perfect! Those cookie sticks are amazing! You are a kitchen artist!